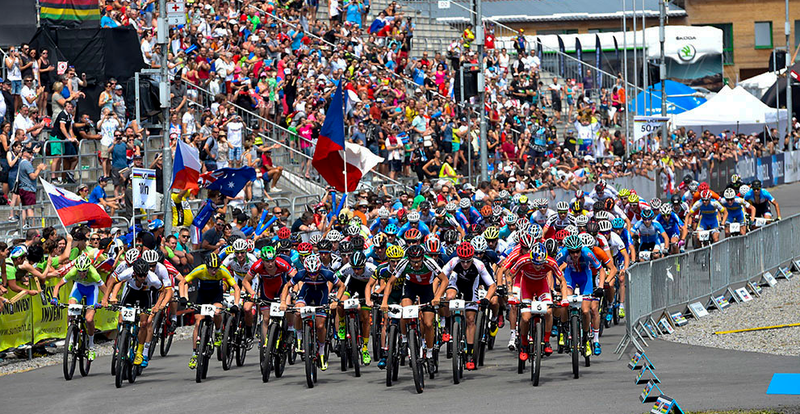 Last weekend was the 2016 Cross Country World Championships in Nove Mesto, Na Morave. Worlds is always a special one. If you’re fast and lucky you get a new jersey for a year. If you have a good race, things normally go really well. However, the majority will not be satisfied with their races. I slotted in with the majority this time around. Peaking is always interesting. You circle one, maybe two races a year where you say, “That’s the one, that’s the one I have to be blistering fast for.” Once you do that, it’s just another race but you’ve put stock in it. Peaking involves tapering for weeks to reduce your fatigue, eating right to be as skinny as possible and focusing on the big show. When all of this goes to plan, you show up on the start line of Worlds feeling your best and you shoot fireworks out of your legs. When you do it wrong, or make a mistake in preparation, you show up with a mind that wants to run hot and heavy but a body that will not cooperate. Sometimes mental limitations are present, but for myself in particular, if the body is running well, the head is running well too. 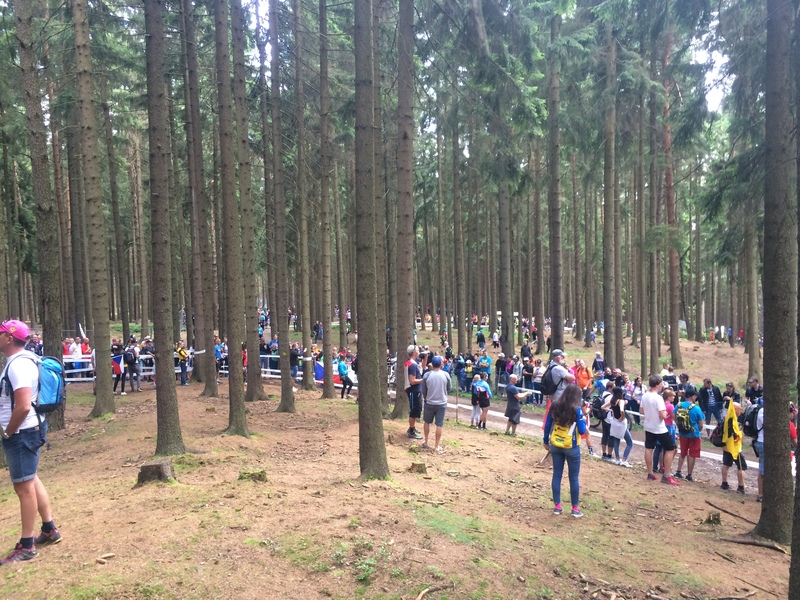 So this year: my favorite venue, third year U23, arguably pretty fit…what went wrong? What can I learn? The race was a hard, hard fight with not a ton of horsepower. 41st is where I finished. 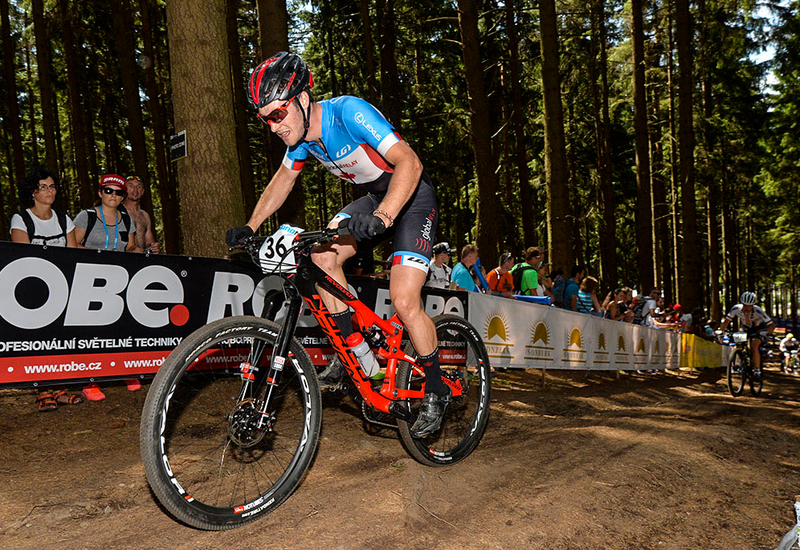 41st is currently the worst finishing position I have ever had at a U23 International Event. I felt like my legs filled up super fast. They felt hard like the pump you get from the gym but not as good as Arnold Schwarzenegger describes (video). I dug super deep to even get through the race. I was still having some fun though; the descents were incredible on my Norco Revolver FS. Just bombing down stuff. It was super upsetting slipping from the group riding for top 25 all the way to outside the top 40. The podium was huge & these stands were packed! Let’s run over the week briefly to try to answer those two golden questions. We arrived in plenty of time before the race and I had a good sleep on the plane. I felt normal with no jet lag fatigue by about the Tuesday. Ok so we can rule out jet lag and travel fatigue. Next, what I did on the bike. Well, easy spins for the first few days to keep fatigue at bay. Course work later in the week but not a ton because I’ve ridden this course before. Riding to and from the venue (30-40 minutes each way) might have added some fatigue – especially on the days that I was riding endurance or harder. I took my chill day during the week to really taper into the race. So far nothing is out of the ordinary. This is a good script that had worked many times before…but there’s one more thing to workout. The day before the race I hit some laps on course. Traditionally, as a junior especially, I would roll a hot lap – something to get the body used to suffering, and get all systems online for the big day. A legit hot lap is faster than your average race pace. I could do this as a junior since I had unlimited energy. These days, like before a successful Canada Cup in Horseshoe, I roll a ‘warm’ lap. This is ~2 minutes slower than race pace. On the day before World Championships, everything was coming together; I was feeling amazing. So amazing that when I went to do my ‘warm’ lap I’m 110% sure it felt so good that I rolled a f*%&ing ‘hot’ lap. This tuned me for the race, but also crushed me enough that on race day my body wasn’t firing on all cylinders. If this is the answer, then it’s only my fault for executing the workout incorrectly and letting my excitement get the better of me. There is, however, the possibility of random, inexplicable bad legs. Although, I’m pretty sure I cooked the chick thighs (my legs) too soon and too fast. Lessons learned: follow your workouts, don’t let nerves, excitement or incompetence mess up your race. Next up is nationals. I can’t wait to roll luke warm.